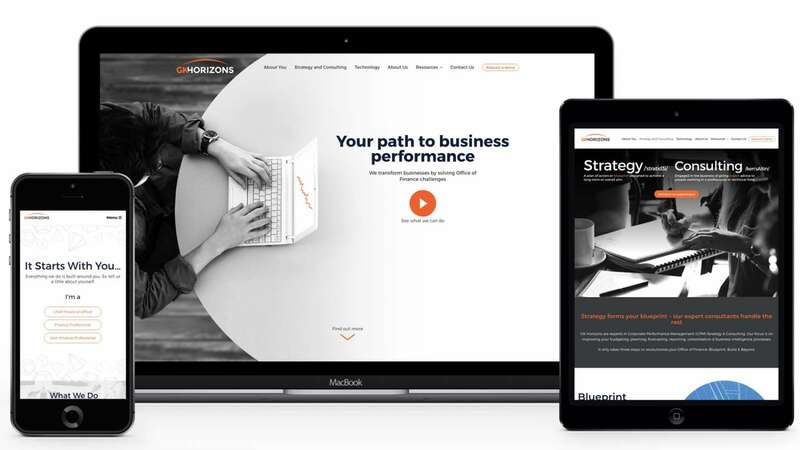 GK Horizons came to us to redesign their website and had the following goals: the website needed to function as a marketing and lead generation tool for the business and the design of the website needed to accurately reflect their status as a leader in their field. GKH also wanted full editing capabilities of the website through an easy to use CMS. 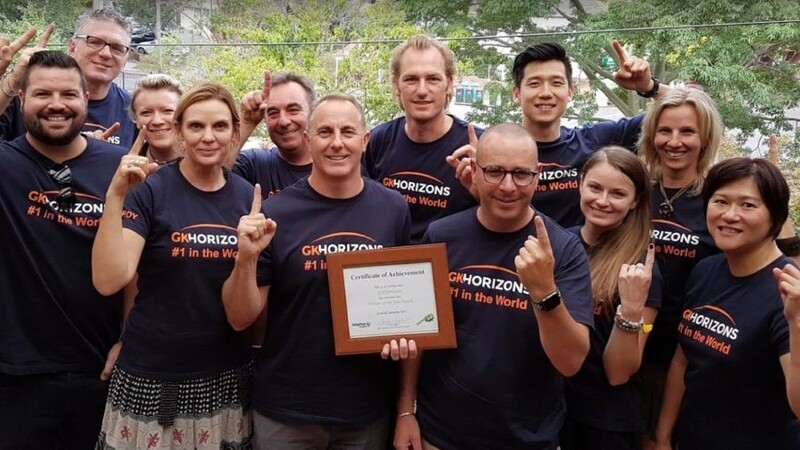 GK Horizons (GKH) is a multi-award-winning, niche management consulting company focused on solving the challenges that finance departments and senior business leaders face monitoring the performance of their business. Founded in 2012 the business has had steady growth and consistently won awards for their performance. Now a recognised leader in finance performance management, GKH’s website no longer reflected their position in the field. The existing website was designed and built by us in 2012. It had fulfilled its original purpose but was now dated and didn’t respond well when viewed on mobile devices resulting in a poor user experience. The site didn’t have any integrated inbound marketing tools and wasn’t generating leads effectively, putting undue strain on GKH consultants in the search for new clients. 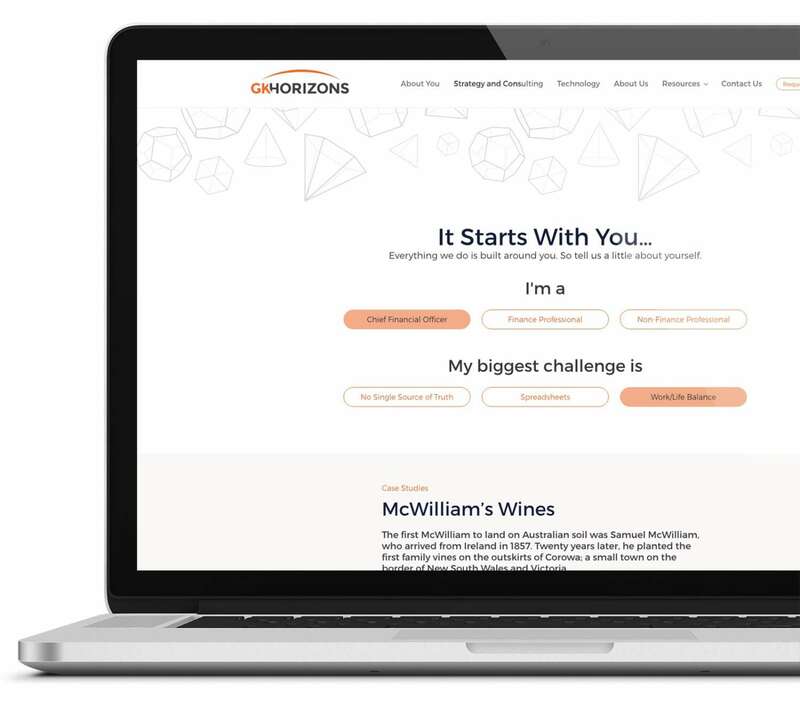 The design of the site was guided by the goal of generating new leads and focused on helping the user meet their needs through user interactions that generated relevant content they would find useful and hopefully reach out to GKH. This is exemplified on the website by the case study generator were the user is asked some questions and a relevant case study is generated. The website aims to appeal to decision makers in the financial sector such as CFOs, CEOs and finance professionals. After a review of GKH competitor websites, we discovered that most of the sites targeted finance professionals with claims the product they offered would improve their business but didn’t have any in-depth case studies to back up the claims or demonstrate the range of finance challenges that they could solve. Engaging.io addressed this gap by dedicating prominent space to case studies and a thorough reference section containing education, news, blog articles and datasheets for users to download. An initial challenge faced by the designers was distilling the large amount of website content the client had generated and organising that content to determine the site structure. Extensive wireframing ensured that the website had a logical flow and the information hierarchy of each page was clear. Another challenge faced was creating a lead generation strategy without being too enterprising and scaring prospective clients off. We decided to be direct and utilised an interactive short quiz which involved asking the user to select their job title and the biggest challenge they face in their workplace. Based on their response a relevant case study is dynamically generated. The case study solves the challenge they have along with a CTA which allows the user to schedule an appointment to meet with a GKH consultant. The system then sends an email to the GKH consultant to see what case study the potential client had viewed when clicking the CTA. There are also datasheets for prospective clients to download via HubSpot pages which track the user details and the datasheet downloaded. Collecting all this information enables GKH to better understand a prospective client’s need. The goal of the site design was to ensure key elements were highly visible. Beautiful imagery reflected the business in a non-standard way and overall there was a consistent visual structure to the site. The limited colour palette of black, various tones of grey, midnight blue, and orange as the highlight colour is used sparingly across the site reserved for CTAs and key text. Displaying a site beautifully across different screens and devices is always a challenge. The design and development team worked closely together to ensure the site responded well on screens of all sizes and proportions. This often involved prototyping a layout for the developers to build out. The site was developed in WordPress to enable the client full editing capabilities ensuring all content, such as images, text, titles, button text, statistics could be managed by GKH allowing them to take complete ownership and direction. Extensive testing on a large range of devices, operating systems and browsers was conducted by both the developers and designers to make sure the site functioned properly across all screens. A strategically designed lead generation responsive website with an easy to use CMS with full editing capabilities using the WordPress platform. HubSpot integration to manage signups to the website gather insights and email clients. And beautiful UI that reflects the leading position GKH has established in the field of business performance management. The GKH online presence has finally caught up to the meteoric growth GKH has achieved. Engaging has been a fantastic partner and gone over and above to assist with all things Hubspot (among other things). They have deep knowledge of the software and understand how to tie marketing efforts in with our website and the Hubspot CRM.